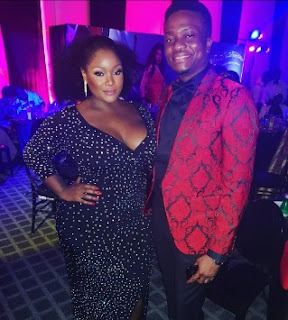 Curvaceous Nigerian OAP, TV host and media personality, Tolu Oniru-Demuren famously known as Toolz was spotted with a visible baby bump with her husband, Captain Tunde Demuren at Nollywood actress Omotola Jalade Ekehinde's 40th birthday party held on Sunday night. The OAP's fans have taken to Instagram to react to the pregnancy after Toolz took to her Instagram page to share the photo above with the caption "#aboutlast night" with a love emoji. Though she did not reference her baby bump, her followers have since taken to the comment section of her post to congratulate her while others prayed for her safe delivery because since her marriage in 2016, there have been multiple pregnancy rumours about the curvy OAP that have suffered miscarriage once the report breaks out.